The chairman of Cleveland Police Authority has resigned after it was revealed he was being investigated as part of a criminal probe. The investigation relates to a number of people with current or past links to the authority, including chairman Councillor Dave McLuckie. 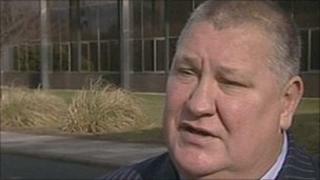 The authority said Mr McLuckie should stay in his post, but on Wednesday he said he was standing down. He said he was leaving because of "pressure" from the investigation. The probe is being led by Warwickshire Police Chief Constable Keith Bristow. It is being conducted by officers from North Yorkshire Police. Warwickshire Police said some allegations involving individuals with associations to Cleveland Police Authority were raised in August 2010. Mr McLuckie has denied any wrong-doing and said he did not know the nature of the allegations. He said: "I received an initial letter informing me that I was one of the people involved, but no-one from the investigation has spoken to me, given me information as to the nature of the allegations or who had made the allegations. "That remains the position today. "When I reported the situation to my police authority colleagues on Monday I was deeply grateful for their unanimous decision that I should continue in my post as chairman. "I do not believe that I have ever acted improperly during my time on the police authority. "It has now become clear that pressures arising from the investigation could cause significant difficulties for the authority if I was to continue, which is why today I have decided to step down from that position with immediate effect."